We conduct talks for various audiences, including primary and secondary schools, junior colleges, tertiary institutions and CCA group gatherings. Talks are also available for national libraries, community centres and other organisations. Through these talks, participants can find out what it takes to keep their furry friends happy, and will also learn valuable and easy-to-use tips to help them better understand their pet. Our talks are customisable and can be worked to suit the target audience. An LCD projector and laptop will be required. Visits are also conducted at our premises. The 1½ hour visit includes a talk about what we do at the SPCA and more about the animal welfare cause, as well as an interaction session with the animals in our adoption shelter. We provide information leaflets, brochures and posters on animal welfare and pet care that can be used for exhibitions to help spread the word for animal welfare. These materials are made available to the public, and can be used for display on exhibition boards or booths. We are proud to introduce "Animal Kind", a groundbreaking publication on animal welfare education for primary school pupils. This book was adapted from the RSPCA's U.K. "Animal Wise" book. "Animal Kind" marks an important milestone in animal welfare education.This resource is Singapore's first ever teaching tool aimed at educating children on appreciating and respecting animals in a fun, interesting and informative way. 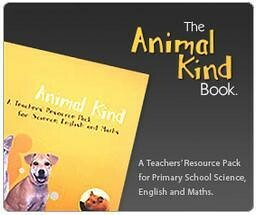 Teachers will find "Animal Kind" a useful and innovative addition to their regular teaching material. The resource book comprises 17 worksheets, fact sheets on different animals and pet care, and a CD-Rom of animal photographs. Children learn how to love and respect animals while learning English, Science, Mathematics, and Civics and Moral Education all at the same time. Click here to download a copy of "Animal Kind". We’re incredibly pleased that the MOE has confirmed the inclusion of Animal Welfare in the new Character & Citizenship Education (CCE) curriculum starting next year, with the primary and secondary students. Our meeting with the Ministry earlier this year regarding the CCE curriculum went well, and we discussed extensively on the importance of teaching our young good values. We cannot stress the importance of these changes to the education curriculum as we are raising the next generation of young girls and boys to be respectable, responsible citizens, and to live lives of kindness, having compassion for animals and fellow human beings. We are currently putting together a dedicated website for educators, teachers and students. This site will serve as a resource material for those who wish to teach or learn about animal welfare. As our schools have a fair amount of autonomy when it comes to deciding the curriculum for the CCE syllabus, we look forward to helping our educators and children with this resource. Read here for the article published in The Straits Times about animal welfare in the CCE syllabus.